This donut recipe contains affiliate links. I am pretty sure that the smell of warm, yummy donuts is about the best aroma on earth. We live right near a Krispy Kreme donut bakery and the kids love getting them on a Saturday morning for a special treat. I decided to try my hand at making homemade donuts as a pre Valentine’s Day breakfast. The donut recipes I came across online all seemed very simple so I bought myself a donut pan on Amazon and got to work! 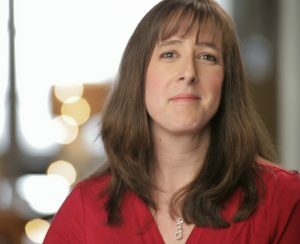 If you would like to treat your kids on Valentine’s Day (or any day!) 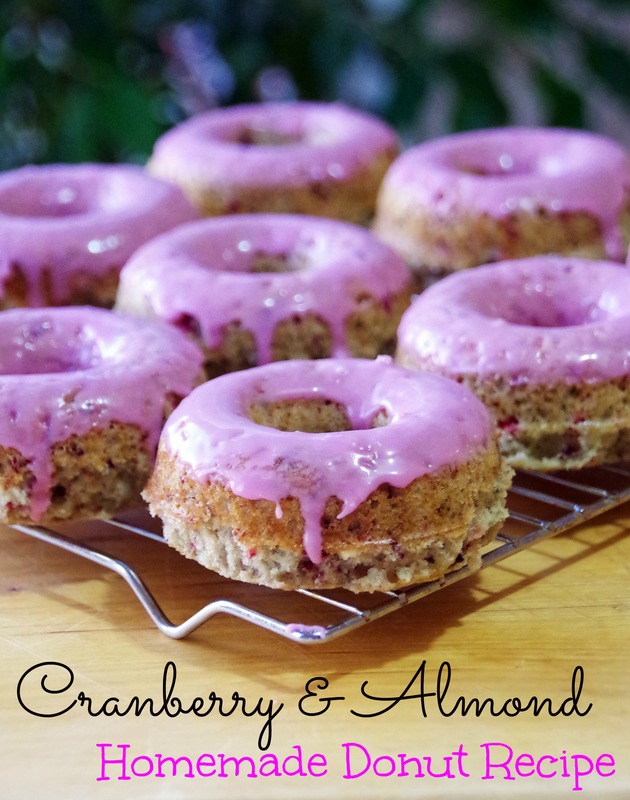 I highly recommend you try out this donut recipe! 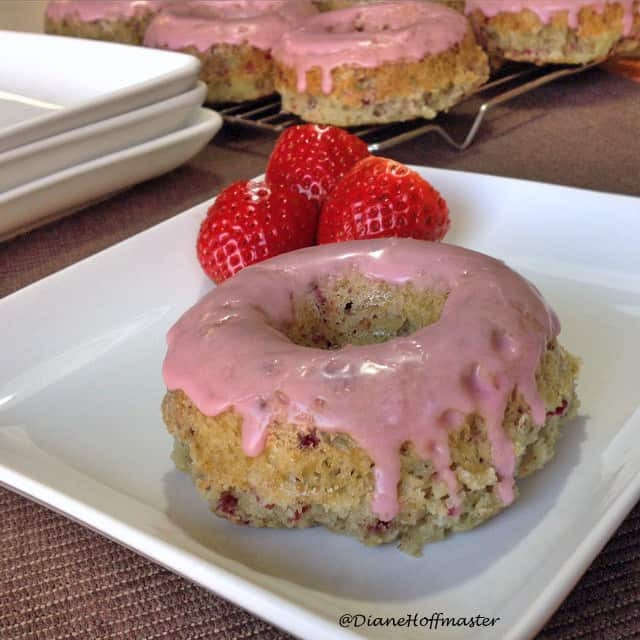 The batter for this donut recipe was incredibly easy but I did add WAY too much batter to the pans. 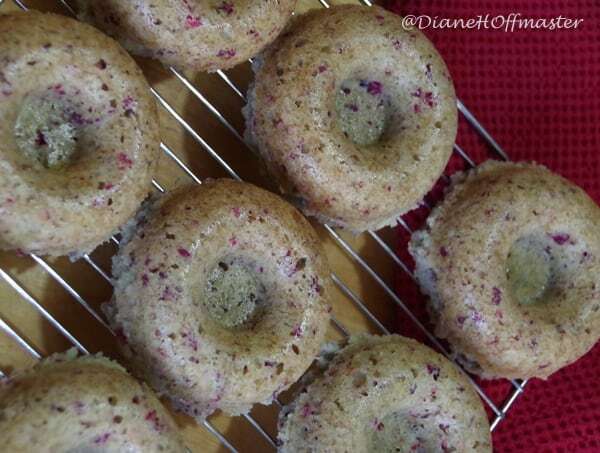 As they baked, these homemade donuts looked more like muffins as they rose up out of the pan and lost the donut hole completely! Well, I am definitely not the perfect cook but they tasted so heavenly I decided to share the recipe anyhow. 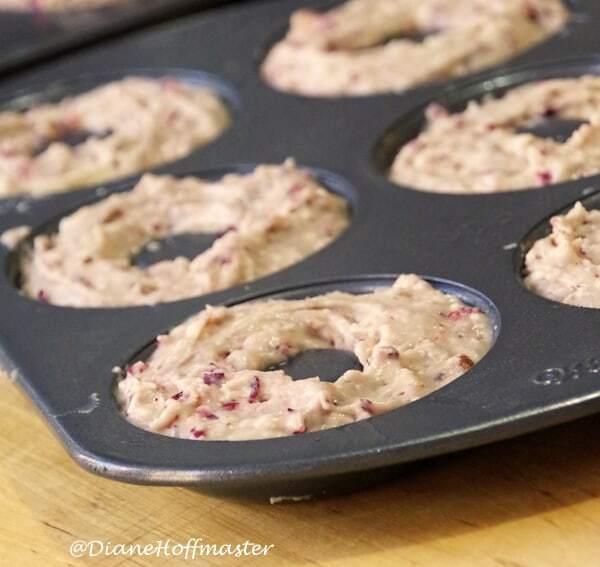 Just make sure you fill the donut pan only half full unless you want cranberry almond muffins instead of donuts! Still tasty, just not quite a donut! In a large mixing bowl, combine the coconut oil and the white sugar. Beat on high until combined. Add in almond extract, orange zest, and eggs. Beat until smooth. Add flour mixture gradually into the oil/sugar mixture, alternating with the milk. Once they are both completely added in, mix only until combined. Add in the cranberry, almond, brown sugar mixture and stir gently until incorporated into the batter. Fill the donut pan HALF WAY full. Do not overfill! Place in oven. Turn heat down to 325 degrees and bake 12 to 14 minutes or until just starting to brown. Mix glaze ingredients in a medium sized bowl. Stir until smooth. Dip donut into the glaze and set on a wire rack. Let dry. Glaze should set in 15 minutes.